Je kunt de Cypcut besturing vinden op al onze Fiber lasers van 300 Watt en hoger. 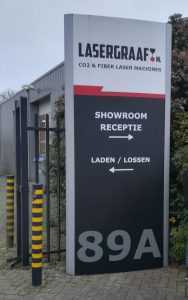 Cypcut is speciaal ontwikkeld voor het snijden en markeren van metalen. Ook bevat cypcut een ingebouwd nesting programma om onderdelen economisch op de metaal platen te positioneren. Dit bespaart materiaal en snij-kosten. Deze Handleiding is in engels. 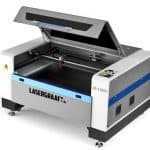 Cypcut is alleen via lasergraaf.nl ook verkrijgbaar in een Nederlandse versie, voorgeinstalleerd op al onze systemen. Thank you for using CypCut laser cutting control system. CypCut laser cutting control system (CypCut for short) is a set of system software designed for plane laser cutting, including laser cutting process, common layout function and laser processing control, most of its functions are applied in graphics processing, parameter settings, custom cutting process editing, layout, path layer planning, simulation and cutting process control. CypCut software can realize process control only if used with Dog and Control Card. CypCut will enter DEMO mode while running on a computer without Dog, so that you can get all other functions except process control for normal use. Therefore, CypCut can be installed in a separate notebook for the design before processing. Please note that this User Manual is only for instructions of main program about CypCut software. Please refer to other Manuals or contact us for the details of other tools installed with CypCut software, such as platform configuration tool. The Document is drawn up based on Version 6.3.646.6 of CypCut. As product functions are being updated, there may be some differences between your product and the Manual. We will apologize for such inconvenience. Please feel free to contact us with any questions or suggestions you may have. The operation of the machine and the effect of laser cutting is directly related to the materials to be cut, the laser used, the gas used, air pressure and the parameters you have set. Please set the parameters seriously and cautiously based on the requirements of your cutting process. The inappropriate parameter setting and operation may result in the reduction of cutting effect, damage to laser head or other machine parts or even personal injury. CypCut laser cutting control system has tried to provide a variety of protective measures, and laser equipment manufacturers/end users should comply with the operating rules in case of injury accidents. The company will not assume any direct, indirect, incidental and/or resulting losses or responsibilities caused by improper use of the Manual or the product. 1.2 Obtaining and Installing the Software …………………………………………………………………………..
1.3 Starting to use ……………………………………………………………………………………………………………. 2.1 Graphical Display Effect ……………………………………………………………………………………………. 2.2 Selection of Graphics ………………………………………………………………………………………………..
2.3.3 Quick Translation and Copy ……………………………………………………………………………. 2.4 Input of Coordinates and Parameters …………………………………………………………………………. 3.1.1 Distinguish inner and outer mold ………………………………………………………………………. 3.1.3 Manually Set lead lines……………………………………………………………………………………..
3.1.4 Check the Lead lines ………………………………………………………………………………………..
3.11.1 Descriptions of Parameters ………………………………………………………………………………. 4.6 Processing and Dry Cut ……………………………………………………………………………………………..
4.7 Stop, Pause and Resume……………………………………………………………………………………………..
4.9 Processing from Any Location ……………………………………………………………………………………. 5.2.1 BCS100 edge seek …………………………………………………………………………………………..
5.2.2 Infared Edge seeking ………………………………………………………………………………………. 6.3 BCS100 edge seek operating instructions ……………………………………………………………………. 6.3.2 One point edge seek Instructions ……………………………………………………………………..
6.3.4 Precautions of BCS100 edge seek ……………………………………………………………………..
6.4 Infared edge seek operating instructions……………………………………………………………………..
6.4.3 One point edge seek Instructions ……………………………………………………………………..
6.5 Adjustment of Motion Parameters ……………………………………………………………………………..
6.5.4 Adjust low-pass filter frequency ………………………………………………………………………. 6.5.5 Set circle and corner precision …………………………………………………………………………. international standard G code generated by Mater Cam, Type3, Wentai and other software. To conduct automatic optimization when opening / importing DXF and other external files, including: to remove repetitive lines, merger connected lines, remove tiny graphics as well as automatically distinguish inside and outside dies and conduct sorting. The above each function can be defined, as well as be carried out manually. To support common editing and typesetting functions, including: zooming in and zooming out, translation, mirror , rotation, alignment, copying, combination and so on. To use the easiest way to set the lead, slotted compensation, micro connection, bridge connection, lead inside or outside, lead seal without gap and so on. To distinguish the inner mold and yang cut, determine the direction of slotted compensation in accordance with the inner mold and yang cut, and check the led. To support curve splitting and connection, curve smoothness, text-to-curve, component integration and exploding. Time-saving automatic nesting feature that automatically co-edge and generate excess material. Easily fill plate through a variety of array patterns. With Flexible automatic sorting and manual sorting functions, to support the function to fix the processing order of internal graphs in group through group. With particular browsing capabilities of processing order, to check the processing order in a more interactive way than that of imitation. Flight cutting path set by a key, allowing processing more with less. To support two stage piercing and progressive piercing, grouping pre-piercing. To support the settings of separate laser power, frequency, laser form, type of gas, air pressure, peak current, time delay and following height for piercing process and cutting process. To edit frequency and power curve in real-time editing, and to set parameters of slow starting. With Powerful material library functions, to keep all processing parameters so that it can be provided again for the same material. With processing breakpoint memory, to trace the breakpoint forwards and backwards; to process some graphics. To be able to be positioned to any point in the process of stop or temporary stop; to start processing from any position. The same set of software supports round pipe cutting and plane cutting, and the way of programming is exactly the same; to support intersecting line cutting. To support given height cutting and following outside-plate.To support automatically seek edge and positioning precise1. With powerful expansion capacity, as much as 30 PLC process edit and more than 50 programmable process. To support the remote control of the system through wireless teachbox and Ethernet3. The operating system should be above Windows 2000. The memory should be 512Mb at least. The VGA monitor should be more than 15 inches with a resolution of more than 1024*768. And it would be better to use 32-bit true color display. There should be two USB interfaces at least. After completing the inspection, you can start to install the software. You can just run the installer directly. If you want to install the program in Vista-based operating system, you should have administrator permission so that it can run. In order to prevent the program files from being modified during the installation process and ensure the normal installation of all drives, please close 360 security guards and anti-virus software in the system. Note: 360 security guards cannot guarantee that there are no viruses in the computer. If the computer has been infected by the viruses, while 360 security guards are running, it may point out that CypCut is a virus, and then cause CypCut not to run normally. After installation, an icon shown on the right will appear on the desktop. 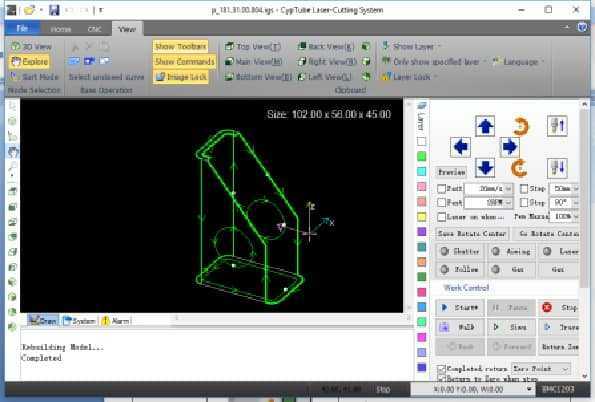 The CypCut laser cutting control system will run after double clicking this icon. Please check whether the dongle has been inserted into the USB interface with normal operation before running CypCut. If the dongle detection fails, the system will enter DEMO mode, and you can use all other functions normally except the process control. The figure with black background in the center of the interface is the Drawing Board; while the white frame with shadows represents the machine breadth, and it displays with grids. The staff gauges at the top and the left of the drawing area and the grids will change with the zooming of the views, and in this way they can provide references for drawing. Above the interface from top to bottom one by one are Title Bar, Menu Bar and Toolbar. The toolbar is arranged with very obvious large icons in grouping and most of the common functions can be found here. The menu bar includes the menu “File” and five toolbar menus, namely “Home”, “Draw”, “Nest”, “CNC” and “View”, and toolbar display can be switched through selecting these five menus. There is a toolbar called “Quick Access Bar” at the left of the title bar, which can be used for fast creating, opening and saving a file; besides, undo and redo commands can also be finished quickly here. At the left of the interface is “Drawing Toolbar”, which is called directly “Left Toolbar” in the following instructions. It provides the basic drawing functions, and the first five buttons are used to switch the graphics mode, which includes selecting, node editing, order editing, dragging and zooming. The following other buttons respectively correspond to the corresponding graph and a new graph can be inserted in the drawing board by clicking these buttons. At the bottom there are three shortcut keys, which are Align Center, Explode selected graphic, and Rounded. At the right of the drawing area is “Process Toolbar”, which is called directly “Right Toolbar” in the following introduction. It includes a “Layer” button and seventeen color square buttons. “Layer” dialog box can be opened by clicking the “Layer” button, and then most of the parameters can be set. Each of the seventeen color square buttons corresponds to a layer, and when a graph is selected, the selected graph can be moved to the specified layer by clicking these buttons, when no graphs are selected, it means to set the default layer for the next drawing by clicking these buttons. The first white square indicates a special layer. When “un-exported Layer” is displayed, the graph on this layer will be shown in white and it cannot be processed. The last two layers are layers of first processing and last processing. There are three scrolling displayed ribbon text windows below the interface. The left one is “Draw Window”. The related prompting messages of all the draw instructions or input message will be shown here. The middle one is “System Window”, and other system messages will be displayed here except drawing. Each message has time mark and they will be shown in different colors according to the importance of the message, which includes prompting, warning and error and so on. The right one is “Alarm Window”, in which all the alarm message will be displayed in red background and white text. There is the Status Bar at the bottom of the interface, which can show different prompting messages according to different operations. There are some basic messages of drawn processing graphics at the left, and some commonly used messages at the right of the status bar, including the location of the mouse, processing status and the location of the laser head. The latter one is the fine-tuning distance parameter, which can move the graphs quickly by using direction keys. The final show is the type of control card. The rectangular area at the right of the interface is called “Console”, and most common operations related to control will be done here. From top to bottom one by one are choices of coordinate system, manual control, work control, processing options and processing count. The whole toolbar is divided into five “pages”, which can be selected by the five menus “Home”, “Draw”, “Nest”, “CNC” and “View”. When selecting each menu, the pages related to the selected contents will appear. Furthermore, the page “Being Processed” will appear during processing and it cannot be switched to other pages before stopping. columns, which is called “Extending Button”, and a related dialog box can be opened by clicking this button. Note: there are small triangles below some large-size buttons, which are called “Drop-downButtons”, a related “Drop-down Menu” will appear after pressing the button, and the menu can offer richer operation options. When the mouse is moved to the top of the button, two obviously different rectangles will appear, the corresponding function of the button can be directly executed by pressing the upper part of the button, while a menu can be opened by pressing the lower part of the button. If you have used Office 2007, Windows 7 or other procedures which use the Ribbon style before, you may have been very familiar with this arrangement. It does not matter even if you use it for the first time, and we are sure that you will like this style soon. Please note that at the right of the menu the recently used files are listed. While the files saved by CypCut are marked with the icon“ ” , and in this way it is convenient for you to find the designed documents of last time. The menu “User Parameters” is used to set some parameters related to the using habits; and the menu “Backup Params” is used by users to backup all parameters as a compressed file; and the menu “BCS100 monitor” is used to monitor and display the interface of BCS100 Height controller in the software; while the menu “Diagnosis” is used for program diagnosis and monitoring. You can see the detailed version information of CypCut software by clicking “About” at the lower right corner. the interface, the dialog box of opening files will be popped, and then you can choose the graphic you need to open. There is a quick preview window at the right of the opening file dialogue box, and it can help you to find quickly the file you need. “ ”and then draw pictures with the buttons of the drawing toolbar at the left. See the details in related chapters. When importing the graphics, CypCut will automatically remove trivial and duplication, combine near as well as automatically smooth, sort and de-group. And usually you can start to set technical parameters without other handlings. If the automatic processing cannot meet your requirements, you can open the menu “File” and “User Parameters” for configuration. like to look over the unclosed curves in the drawing board, you can click the buttons “ ” and “ ” under menu “View” in the toolbar to highlight them. You can also click the big button “Select” at the leftmost side of the toolbar, and then click “Select Unclosed Curve” to choose all of them. as the start of the graphics, you can change the start of the graphics; if you click outside the graphics, and then click on it again, you can draw a lead manually. You can press Ctrl+A to select all the graphics as quick start tutorial, then click the button “Lead” and set the parameters of the lead lines, and then click OK. In this way the software can search suitable positions to add the lead automatically according to your settings. You can conduct the Lead Lines Check by clicking the small triangle below the button “Lead” and selecting “Check lead lines”. When select “Distinguish inner and outer mold”, lead can be automatically optimized according to inter and outer mold. You can set detailed cutting technical parameters by clicking the button “ ” in the toolbar at the right. The dialog box “Layer Parameter Settings” contains almost all the parameters related to the cutting effect. clicking the button “ ” under the “Home” or “Nest” menu, while you can select the ways of sorting and control whether it is allowed to change the direction of the graphics and automatically distinguish inner and outer mold during the automatic sorting by clicking the small triangle under the button,. toolbar at the left to enter the manual sorting mode, and click the graphics with mouse one by one, and in this way you can set the working order . You can specify the order between these two graphics through pressing the mouse and drawing a line from one graph to another. You can fix the order of several sorted graphics by selecting them and then clicking “ ” button under “Home” or “Nest” menu. The following automatic sorting and manual sorting will not influence the graphics inside the “Group”, and the “Group” will always work as a whole. You can conduct automatic sorting for the graphics within the group by selecting a “Group” and then clicking the right key with selecting “Group Sort”. Before the actual cutting, you can check the working route. You can align graphics by clicking align button; you can view the processing order quickly by dragging the interactive preview progress bar under “Draw” menu as shown below, and you can view the processing order of the graphics one by one by clicking the interactive preview button,. Please note that this step must be done on the actual machine with the support of dongle and the control card. machine breadth on the screen by clicking the left button “ ” above the “Console”. This corresponding relationship is calculated in accordance with the dock point markers on the screen and the position matches of the machine laser head. Some common coordinate markers on the screen are shown in the photo below. When you click “Preview”, the “Dock Point” will be moved to the “Laser Head Position” and visually parallel move occurs in the graphics on the whole. If the “Laser Head Position” shown by the red cross cursor does not match the actual laser head position of the machine, please check whether the position of the machine origin is correct, and it can be corrected through “Numerical Control”—“Go Origin”. After previewing, if you find that the graphics are outside the machine breadth wholly or partially, it means that it may exceed the range of travel during processing. corner of the upcoming processing work-piece, you can set the lower left corner as the dock point and so forth. click the button “ ”, and the machine will run completely without laser along the graphics which will be processed so that you can check more carefully whether there may be any impropriety in the processing. continue to work by clicking the button “ ”. system will allow you to continue the processing from the position of last stopping. CypCut provides the common drawing functions, which can be available easily from the drawing toolbar on the left. The use of these functions is similar to AutoCAD mostly, and it is very intuitive. Thus, this Manual will not introduce them in detail, if you have any questions, please feel free to contact the customer service staff or Friendess Electron for help. We will introduce some special graphical operations of CypCut as the software for laser cutting. off state “ ”, the arrow will disappear. center of the screen. If no graphs are chosen, please just click the button directly, and the whole graphs will be displayed in the center. By clicking the button “ ” in the lower right corner of the column, a dialog box will be opened, and it can conduct more detailed control for the drawing board, including turning on and off the auto attach key-points, turning on and off the ruler and controlling the pick precision of mouse. The views can be zoomed by scrolling the mouse wheel in the drawing board. By clicking F3, all the graphs will be shown in the center of the screen. By clicking F4, the machine breadth range will be displayed in the center. The above operations can be selected by clicking the right key of the mouse with selecting “Zoom” in the drawing board. CypCut offers a variety of graphical selection methods. The basic operation is “Click Selection”, and the graphs will be selected just by clicking the mouse on the graph. Another more common operation is “Box Selection”; by this way, a translucent box can be formed by dragging the mouse in the screen to select the graphs. There are two kinds of box selection. When dragging the mouse from left to right, it shows a blue translucent rectangle with solid line and only the graphs covered completely in the rectangle box can be selected; when dragging the mouse from right to left, a cyan translucent rectangle with dotted line will appear and as long as any part of the graph is in the box, the graph will be selected. The schematic diagram of these two options is shown below. The left one is the option from left to right and BC will be selected; while the right one is from right to left, and ABCD all will be selected. Flexible use of these two methods can help you to choose the graphs you need in a more convenient way. No matter it is “Click Selection” or “Box Selection”, if you press “Shift” while you make a selection, you can add or cancel selected graphics without the need for clearing the original selection. When you click the button “Select”, a drop-down menu will appear, through which you can conduct senior selection operation, including the selection of unclosed graphics, similar graphics, all outer or inner mold, and all graphics smaller than specific size. Among them, “Select similar curve” allows you to select all the graphics which looks close to each other on the drawing board. For example, you may select all the circles with a diameter of 5mmm by selecting a circle with a diameter of 5mm and then clicking “Select similar curve”. transformation functions. Select wanted transformation graphics before applying. Most of the commonly used geometric transformations can be completed only by clicking the drop-down triangle under “Transform”, for examples: Mirror, Rotate, Align and Scale. CypCut provides 7 fast size transformations, which can be completed by the drop-down menu below the button “Scale”. Click the small triangle under “Scale” button, you can open a drop-downmenu, providing selected graph operations of size transformation, as shown below. For examples: “100mm” means to zoom graphics in equal proportion with a width of 100mm, “2 Times” means to zoom graphics in equal proportion by 2 times. If you want to input accurate size, please directly click the button “Scale”, the following dialog box will appear, then you can input the new size and complete the size transformation by clicking “OK”. the cancel lock status by clicking the button , and then the button will become . “Zoom Center” can determine the location relations between the new graphics and original graphics after being zoomed. For example, when you select “Upper Left”, it means that the new graphics and original graphics are aligned in accordance with the upper left corner after the transformation, and other parts are zoomed by taking the upper left as a basis. Note: The lead and slotted compensation set for graphics cannot be transformed at the same time, and the numerical value of lead and slotted compensation will not change after the size is changed. CypCut provides 3 kinds of interactive geometric transformation, including interactive zooming, rotation and mirror, and you can achieve more detailed geometric transformation through them. Before doing these operations, you need to firstly select the operation graphics, click the corresponding menu or button, and then conduct operations in accordance with the tips at the bottom of the screen. 5)You can complete the operations by directly inputting 45 and then clicking Enter. 6)Please move the mouse to the lower right corner of the rectangle, at this moment, click to form a horizontal line and take it as the start line of rotation. The operations of interactive zooming and mirror are similar with this, so there is no further explanation. shift away a graphic temporarily and quickly, then you can focus on the design of other graphics, and later you can move it back to the original place rapidly. Since the fine-tune distance parameters can be controlled precisely, you do not have to worry about the deviation of the graphical positions. You can copy the selected graphics by pressing Ctrl and the direction key concurrently. For example, when you press “Ctrl + Rightward”, the selected graphics will be copied at the position with a distance of 100mm on the right. In some cases, you may hope to draw with precise coordinates. And CypCut allows you to input the coordinates directly and the input format of coordinates is as follows: <X coordinate><comma,><Y coordinate>. For example, if you would like to input the coordinates (100, 100), you can only input “100, 100”. And the inputted coordinates and parameters will be shown in blue. Most of the drawing operations allow both mouse operation and inputting coordinates directly. Below is an illustration for drawing a rounded rectangle with a length of 300mm and a width of 200mm and a fillet of 25mm. 1)You need to click the icon “ ” on the left toolbar, and then “Please Specify Start Point” will be prompted on the screen. 2)You need to input the coordinates “0, 0” and press Enter, and then “Please Specify Cross Point” will be shown on the screen. 3)You need to input the coordinates “300, 200” and press Enter, and then “Please Specify Corner Radius or [Fillet (F)]” will be shown on the screen. 4)You need to input 50 and press enter. All the operations are completed, as shown below. Cypcut will provide the functions of automatic adsorption during drawing according to the needs, including automatic adsorption to the grids, adsorption to the critic points of the graphics, adsorption to the borders of the graphics and so on. adsorption can also be set in the above dialog box. CypCut supports text input and text conversion to curve. After clicking the button“ ” on the drawing toolbar at the left, you can insert text in the position where you hope by clicking the mouse and the newly inserted text will be selected automatically. Please note that once the text is converted to the curves, the above option cannot be used any longer. If you would like to design a text with specific font and special effect, please convert it to curves after you design it well. Please select the graphics to be processed, click the corresponding buttons, and then operate according to the prompts. selected curve according to a given precision” will be shown on the dialog box. Please input the expected curve smoothing precision and then click ok. The contrast between the original curve and the smoothed curve is as shown below. In order to facilitate the observed effect, the curve smoothing precision value entered here is greater. Please use the actual value according to required processing precision. need to split. The process of curve split can be carried out continuously as far as ESC cancels the command or it is switched to other commands. Sometimes the imported graphics may include the curves which are visually imperceptible, which causes the display size to become very small, or move to an abnormal position when processing. These graphics can be deleted through the function “Remove trivial”. You may click the button “Remove trivial”, set the size range of the graphics, and then confirm the operation. The graphics smaller than this size will be deleted and other curves will be retained. merged, then click “ ” and input merging accuracy, lastly confirm the operation. Note: The end points of the graphics in visual may be not the ones in geometric, and the excess backtrack lines may exist in the end points, and these graphics need to be split and deleted firstly through “Split”, and then can be combined. This chapter will describe the related functions of technical parameters provided by Cypcut. Because most of the technical parameters have direct relations with the materials to be cut, the used lasers and air pressure, you need to set the parameters according to the actual technical requirements. All the parameters mentioned here including the ones in the graphics should only be used as examples rather than being considered as guidance parameters. even damage to the machine, so please set the parameters carefully. When opening the external files such as DXF and so on, CypCut can distinguish inner and outer mold automatically. If the graphics are modified during editing and they result in the changes in the relationship between inner and outer mold, you can click the button “Auto Sort” when the inner and outer mold need to be distinguished again, and then any way of sorting can distinguish them, which is required to select “Distinguish inner and outer mold when sorting”, locating at the drop-down menu of “Auto Sort” button with default selection. Also, you can directly click drop-down triangle button of “Lead” and select “Distinguish inner and outer mold. CypCut distinguishes inner and outer mold in accordance with the surrounded relations, and it always takes the outermost layer as outer mold, while the next one as inner mold, then outer mold and so forth. Besides, an unclosed graphics cannot form a layer. If you would like to start outer mold from one layer, you can choose all the graphics from this layer and inside it, group them, and then distinguish inner mold and outer mold through “Group Sort”. The supported lead types include Arc, Line and Line + Arc, while the supported parameters consist of lead type, lead angle, lead length and lead radius. You can also choose whether to add a small hole at the starting point of Lead lines. When you select arc leading, the end of the circular arc needs to keep in tangent with the graphics to be cut (no matter how big the set angle is). As shown in the right figure. In fact, the angle set at this moment is an included angle between the connecting line of the start point and the end point of the lead line and the graphics to be cut. The lead out lines are similar to it.